The Kandariya Mahadev Temple built-in 1050 AD by the Chandela King Vidydhara to celebrate his victory over Mahmud of Ghazni, is dedicated to Lord Shiva it is the most impressive and refined temple among all the temples in the Khajuraho , with over 900 sculptures carved into sandstone stacked without mortar the Kandariya Mahadev temple is a fine example of the craftsmanship of the medieval times. Kandra in Sanskrit or Hindi means Cave . The east-facing Shiva temple is a culmination of the design , Shikara rises about 30 meters (100 feet) above the platform which it shares with the older Devi Jagadambi temple. 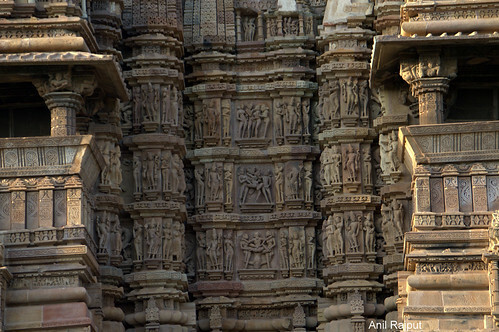 84 smaller replicas adorn the main tower in a soaring, mountainous profusion. 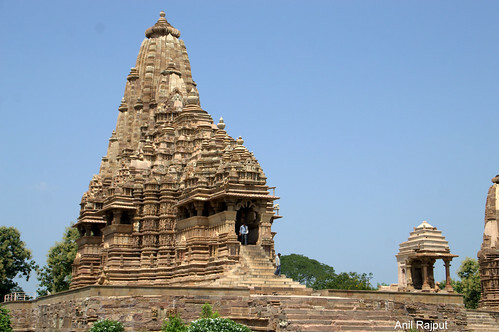 The Carvings on the temples portray a wide variety of sexual acts( Mithuna), in different styles and moods – refinement and vulgarity, tenderness and lust, calculation and spontaneity, can all be found here, in a seemingly endless number of configurations and positions. On the South wall the first statue is of the lord Ganesha and then the Chamunda one of the sacred Seven Mothers or the Matrikas slayer of two demons the Chanda and the Munda , this statue is damaged but brilliantly captures the goddess’ terrifying image. Next is the image of Bhairav the lord of death and cremation grounds is a fierce manifestation of lord Shiva shown here bearing a skull, hand drum, headdress of stylized flames, and accompanied by a Dog Vahan ( carrier) followed by other sacred Matrikas namely Ma Aindri, Ma Varahi, Ma Vaishnavi, Ma Kaumari, Ma Mahesvari, Ma Brahmani ( or first sacred Matrika) and Ma goddess Virabhadra. The Temple has the main entrance a cave ( Kandra ) like opening the Mukha Mandapa, with a Makara Torana (an arch in the form of the makara Crocodile, a mythical water creature with the jaws of a crocodile, ears of a lion, horns of a ram and tail of a fish) has been carved out of a single stone and draped with loops from one side of the doorway to the other, leading the passage two halls the Mandapa with two balcony the Bhadravalokna , the inner roofs of the porch and mandap are created like great upside down pools with flower and leaf motifs, the main room where the white marble Shivaling is established is the Garbahgriha and a space between the Mandapa and Garbhagriha is Antralaya . 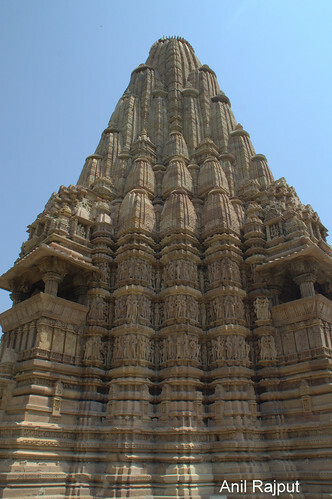 The great multi spire tower of the sekhari type, the most important conspicuous feature of the North India ( Nagara) temple , is characterized by an ascending cluster of spires reflecting the idea of the temple as a mountain . On the southeast wall a woman plays with a ball, another stretches her love-tired limbs, another gazes into a mirror, one engaged in writing a letter. On the South side the couples are kissing, their bodies entwined in such a perfect union that one can cannot tell the arms and legs of one partner apart from the other. 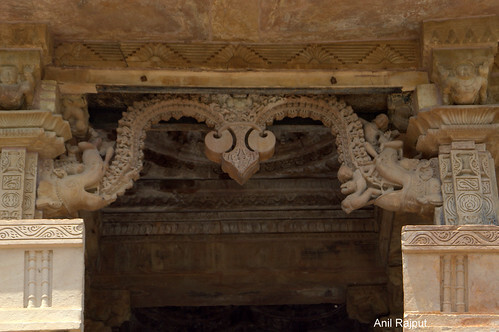 The love making scenes on the north side wall are more elaborate, often acrobatic and symbolic.